Our precious twins were born on 11/23/12 at 37 weeks. Logan Elias (Baby A) came into this world weighing just 5 pounds 5 ounces, while his identical brother Ben Tobias (Baby B) was a wee bit bigger at 5 pounds 12 ounces. They both spent 4 days in the NICU, but fortunately they were able to go home when we did, although it was over 12 hours before I could even hold them. Congratulations! They are absolutely gorgeous. Wishing you many happy healthy years to come. eeeee love these pictures & congrats again, so excited for you! Congratulations!!!! Logan and Ben are absolutely beautiful!!!! So sweet! Congratulations again, so glad everyone is home and OK! So many congratulations from all of us to your entire family! Beautiful boys! They are beautiful, Tara, and I absolutely love the names. Love love love. Can't wait to snuggle them. Oh my goodness! So sweet! You're going to have to pull out that cuddly photo when they're 3 and making you crazy! Awesome pics and adorable boys, hon! 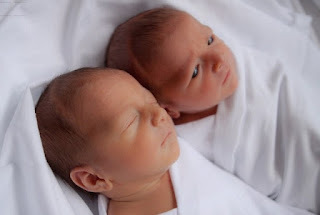 How adorable are your little twin babies....cant wait to meet them! May god bless you and your family on your new journey in life. Love you all! Congratulations! They are so beautiful! Our boys were so similar (just a few ounces smaller, 2 more days in the NICU) and I also couldn't hold them for over 12 hours. That stunk! Congrats to you guys! Both boys are gorgeous! OMG Congratulations!!! They are beautiful and I love how they are cuddling close together. How awesome! I hope you are doing well!! Congratulations, Tara! They're so beautiful! Congratulations, I got goose bumps when I clicked over to your blog today. WONDERFUL! Oh Tara! Congratulations! Squeal! I am so jealous, I secretly always wanted Twins! Enjoy your Blessings!